Shinobu Goto is an associate professor at the Graduate School of Symbiotic Systems Sciences, Fukushima University, Japan with a specialism in environmental planning. He is interested in environmental education, especially nuclear power and radiation education after the Fukushima Daiichi nuclear power plant accident occurred in March 2011. 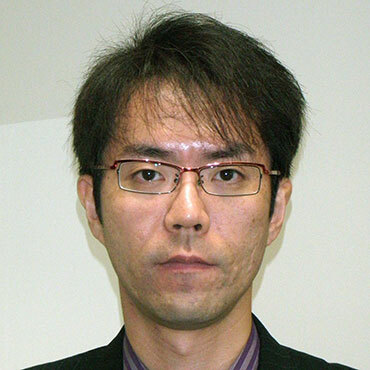 More specifically, his work analyzes the “fairness” in public educational materials, such as the Japanese government’s supplementary readers on nuclear power and radiation, using the method of content analysis. 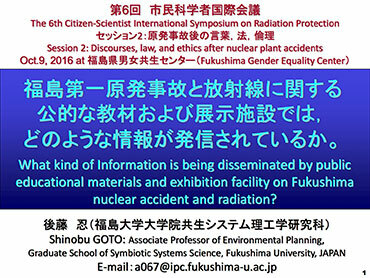 In March 2012, he and colleagues formed the Fukushima University Research Group of Supplementary Readers on Radiation to create an original, alternative supplementary reader on radiation to controvert the Japanese government’s supplementary readers. What kind of Information is being disseminated by public educational materials and exhibition facility on Fukushima nuclear accident and radiation? Before the Fukushima Daiichi nuclear power plant accident in March 2011, the Japanese government had promoted nuclear power for the generation of electricity over several decades, devoting vast resources to public relations (PR) to persuade the public that nuclear power was both safe and necessary. These resources included government-sponsored advertisements in newspapers and on television and public educational materials such as a supplementary reader on nuclear power for school children. Consequently, many Japanese people believed the nuclear power plants in Japan would be safe even if a large earthquake and tsunami occurred – a notion now known as ‘the myth of nuclear power plant safety’. One of the most important lessons from the Fukushima nuclear accident is that fairness, accuracy and balance in the government’s discourse with the public on nuclear power are essential to prevent the spread of ‘myth’ and promote the Japanese people’s critical thinking. Five years have passed after the Fukushima nuclear accident, weathering of the memory of the accident has been a concern. In order to disseminate information about the facts and lessons of the Fukushima nuclear accident and knowledges on radiation, the Japanese government and local municipalities issue new educational materials and construct exhibition facility on nuclear power and radiation. They provide information focusing situations after the accident, scientific knowledges on radiation and history of reconstruction of Fukushima prefecture. On the other hand, they do not include adequate information, such as the Japanese government’s and local municipalities’ responsibilities for the accident and standards of radiation dosage levels prescribed by law. In today’s my speech, I would like to analyze the information critically and discuss how to improve it. All Right Reserved CSRP 2016.